I found, in the Mahler concerts I had heard, two extremes. One was sort of exaggeratedly emotional, in the sense that the text was used as an excuse for self-expression on the part of the conductor, sometimes at a very high level. Others withdrew from any kind of emotional content, making it rather dry. I remember the most wonderful performance of Mahler’s 9th with Giulini, but then people were saying: “Oh yes, Giulini is a fervent Catholic, and you feel this redemption, and you feel this being as one with God, and all these things.” In the end, I’m reminded of a reply by Toscanini, when he was asked about the ‘Eroica’ Symphony and they said, “Maestro, what do you think? Some people say that Beethoven wrote the ‘Eroica’ against Napoleon.” “Ah!” he says, “I know, they say it is against Napoleon, and then they say it is against Mussolini and against Hitler. For me, the ‘Eroica’ of Beethoven is Allegro con brio.” In other words, it is very dangerous to try to verbalise music, because in the end we don’t speak about the music, but we speak about our reaction to it. I don’t believe that music is either emotional or rational. … If there’s only emotion you cannot really make music, because music is a combination of things; music is larger than all of this. And the difficulty with talking about music is that music definitely has a very strong content, but that content can only be expressed in sound. If you try to express it in words, you only reduce it. The greatness of music is precisely that it can laugh and cry at the same time, that it can be mathematical and sensual at the same time, that it can be all the extremes put together. Music, in that sense, is a whole creation, it’s a creation of a world where everything is expressed through sound. And therefore whatever you say about it is not a description of the thing itself, but a description of your perception of it at that moment. … you can imagine everything, and have a lot of images, and you can imagine that this huge fortissimo in the 9th Symphony of Beethoven in the last movement, “Und der Cherub steht vor Gott, vor Gott, vor Gott, vor Gott”, and there is a fantastic, terrible modulation, that you feel the whole world comes to, you know. And somebody will tell you, this is already a premonition of Auschwitz. Sure, you can imagine all those things, and these images very often are very helpful to many people in the way that they perceive the music, but the music is always larger than that. I hope Barenboim will forgive me for this selective use of his words in order to highlight one of the important themes that runs through his interview. In learning how a musician hears — or doesnt hear — music, we find pointers that the non-musician can perhaps apply in developing his or her own approach to listening to music. Significantly, Barenboim chooses not to conduct all of Mahler’s symphonies, confidently limiting himself to those with which he is in sympathy — currently 1, 5, 7, 9 and Das Lied von der Erde. In this he emulates conductors of the previous generation — Walter, Klemperer, Giulini, Furtwängler — who, unlike Mengelberg and Bernstein were also selective. Daniel Barenboim’s official website is here. 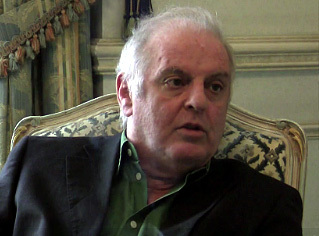 The photo and interview with Barenboim from 27 April 2009 is © Universal Edition. Extracts are included here as “fair use”, for the purpose of study, review or critical analysis only.